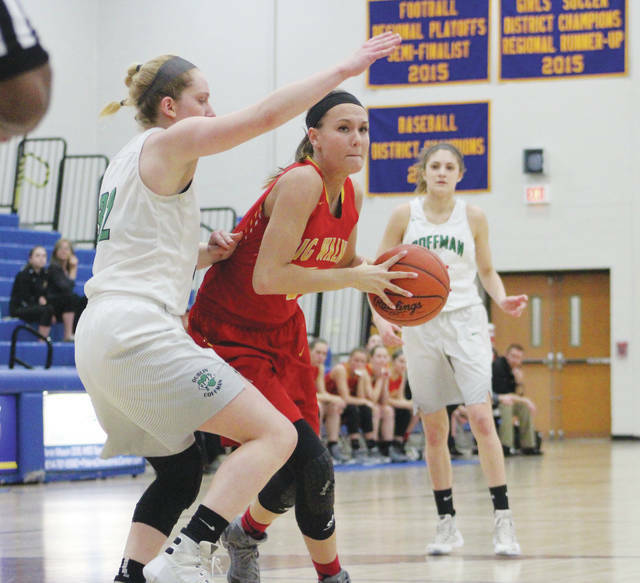 Big Walnut’s Katie Cochran works against a Dublin Coffman defender during a game last season. Having coached at the high school level for 20 years, Jason Crawford knows what it’s like to step in and start building a program. This year, though, despite being his first as coach of the Big Walnut girls basketball team, he won’t have to do much building. The foundation is already in place. The Golden Eagles finished 15-9 last season, that after winning just eight games during the 2015-2016 season. In other words, they’re trending upward. To make matters even better, they have three starters back from last year’s squad — Erin Boehm, Paige Norman and Katie Cochran. “We are expecting big things out of our returning starters,” Crawford said. “We want them to provide leadership and be role models for the younger kids in the program. We also expect them to set the tone with their intensity and enthusiasm. Crawford, who won a couple Coach of the Year awards while at the helm of the boys’ team at Danville, said Stacey Walters, Emily Neff and Abby Facemyer could also see plenty of time in the starting lineup over the course of the season. Avery and Alexis Schone, along with Rylee Bussen, are also expected to see plenty of time on the floor. The girls are familiar with each other, and have plenty of experience, but the success of the BW volleyball and soccer teams forced them into a bit of a late start. That said, Crawford knows it’ll take some time for them to adjust to his system. As for what Crawford wants them to do on both ends of the floor, well, he wants them to be able to do a little of everything … not as individuals, but as a team. The Golden Eagles will open the season at home Tuesday against Marion Harding. League play starts Dec. 5 against visiting Groveport.